This feature is my attempt at the "Pay It Forward Craft Exchange" for more information, click here. Look forward to two more interviews that will also be posted today! Have you heard the good news about my friend Karli? Karli, and her husband Chris just brought home a bundle of adopted love, daughter Kaiya. Do you want to know some more good news about my friend Karli? She has a very good friend named Jamie Maxfield. That is right, the Jamie Maxfield born in Hawaii in 1977. Which means that contrary to popular belief, I wasn't the only one who turned thirty this year. I am also not the only thirty-year old who hates the phone. "I hate the phone." explains Jamie. But her husband Tucker doesn't. "He has not one single aversion to the phone." and, adds Jamie "He's also really cute." Jamie the self-proclaimed "devil's advocate" met Tucker in 1999 when he was a server at the Hard Rock Cafe in Salt Lake City. She exclaims that it was love at first sight when she couldn't help but feel appreciation for his lips and. . . buttocks. He returned the love by falling for her natural red hair. "My husband prefers for me to keep it completely red. He loves it." Tucker's love affair with red heads may have stemmed from his own dark red-headed mother who passed away when he was thirteen. While Jamie may have to wait to meet Tucker's mother, she absolutely loves the rest of his family. The red headedness is spanning the generations as two out of their three children have red locks. Yes, and Tucker loves the color red for another reason. "He says he 'bleeds red' because he is a die-hard Ute fan." Jamie learned effective parenting skills from her mother and father. "I love that my parents introduced me to the Gospel- they taught me to be grounded and open-minded simultaneously." 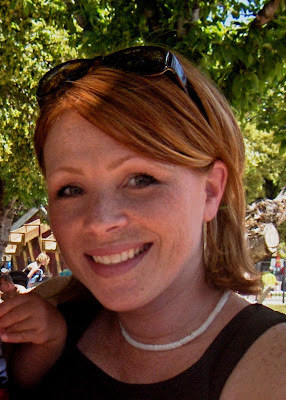 Jamie's mother was inactive in the LDS church for most of her life. After Jamie was born (the oldest) she decided to give church another try. This "full force ahead" life change initiated a devotion to the LDS church. Jamie's father, who was not a member, took three years to investigate. "He had to know everything before he joined." Jamie's father also knows everything about math. "[He] constantly did math with me-it taught me to love numbers." Meanwhile, Jamie's mother had an equal important lesson to teach her daughter. "My mom has a sweet tooth and treats weren't scarce-it taught me that a sweet tooth is okay . . .in moderation." Now she has her own family, a nest of daughters. And given her ability to use unique adjectives I asked her to describe each daughter. Jordyn (5) is fiery, spunky and in-charge. Lexi (3) is soft, quiet and imaginative. Peyton (10 months) is still coming into her personality, but so far she is happy, observant and (best of all) cuddly. And then the inevitable question: is there a son in your future? "[Tucker] loves his girls so much, but he desparately wants a son. I get deathly sick during pregnancy, so we are strongly considering adopting a fourth and final child . . . possibly we'll get our boy." With an adoption possibly in her future, Jamie will most-likely rely on her friend Karli for advice. This I can speculate for a couple reasons, one being that Karli knows Jamie very well. Of her friend she says "You will find her madly interesting and pretty much amazing!" So true. Red head, freckles, sweet tooth and all. 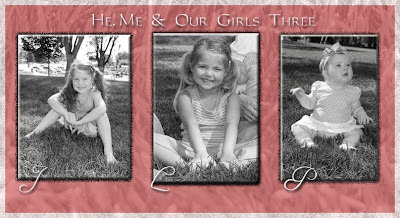 Read more, see more and love more of Jamie on her blog He, Me and Our Girls Three!